HELP need to find the engine number for my FD's 13B REW!!! Due to the stupid laws and **** retentive tossers at the VTNZ here in NZ I am required to supply an engine number for the re-registration process for my car. Does anyone know where I could find the engine number for my motor? The only numbers that are on the block is... 13B. I am positive thats the only numbers on the block, someone correct me if im wrong. Sweet, thanks guys I will pull off my alternator tomorrow and get the number off. Now all I have to do is get the damn thing certified for the previous accident damage its had even though it has NOTHING to do with why it was deregistered!! Great there goes at least another thousand bucks! There is a hanger bracket in the front of the engine. It attatches to a 2 hole "ear" on the front iron, between the alternator and the oil feed hole/fitting. Right in front of that "ear", stamped into the front iron, is an engine serial number. Of course, the number is only useful for identifying the front iron, since the rotary engine is modular and parts from several engines can be used to assemble one. 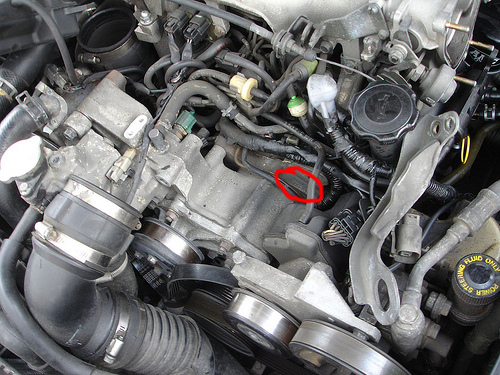 to see it, Do I need to disassembly the alternator or is visible just opening the hood? You'll need to pull the alternator. And overtime it could be covered with some dirt and grime. Should be on the front iron under the alternator. If it ever had a reman there should be reman tag on the front cover. Earlier remans had it above the crank angle sensors. The newer ones are under the water pump. I have no idea how it works in NZ, but if they have restrictions on engine swapping like they do here in CA, having an engine number other than what came from the factory may entail extra paper work. Find out what the original engine number was from Mazda NZ customer service number (0800 800 626). Once you know the politically correct engine number you should be good to go. Yep, here in Australia for registration purposes (very similar to NZ) they needed to witness the engine number of my car, which is under the alternator. You need to remove the alternator to see it. When I removed my alternator, I wrote the number down and filled it into the registration form. That was deemed unacceptable as I "could have made the number up" and they had to have one of their government inspectors come down to the car and physically SEE the engine number with his own eyes, in order to let it pass. Same story with my BMW V8. An inspector had to come to my house and crawl under the car to sight the engine number up on the side of the block for it to be verified. compression numbers to expect from flooded engine? Quick Reply: HELP need to find the engine number for my FD's 13B REW!! !